Wow! Now that really draught tolerant! An article in The Times of India describes a current exhibit of succulent plants, but do we really have to use the stereotypical common names that sometimes seem irresistible to some people. The "Golden Barrel" (Echinocactus grusonii) is described as "Chinocactus ...'Mother-in-law's Chair'"! It also appears that they really grow them "hard" in India: "Typically, a desert plant can survive more than 40 years without water." We're just ending the worst cold snap we've had in a couple of years - 19 or 20F at night - but the signs of Spring are all around us. Bulbs are emerging: Snowdrops, daffodils, Iris -- some will be flowering (snowdrops, daffies) within a week or two. At the same time, the Banana Trees have been hit pretty hard, but they'll come back later this spring, and one of the Aloes we were experimenting with bit the dust. I don't know about you, but I'm ready for Spring! Heating is just too expensive this year. Now I know our cold is peanuts compared to some of you. Please, share your experience with growing succulents in cold weather areas. We'd love to hear from you. Remember plants accumulate dust as much as any other surface in your home. Clean plant leaves, especially succulent plants, with a damp cloth and cold water. Have you ever done this? The other day I was at the dentist's office when I noticed the Sansevierias near the elevators. They were filthy. Reaching for the tissue in my pocket, and checking to make sure no-one was watching, I proceeded to clean every one of those leaves. Oh...and by succulents, I don't think they mean to include most cacti! Just what we need; another succulent plant being commercialized for diet use. Apatrim, according to the story, is a "newly released diet pill" which contains an extract of Caralluma Fimbriata, a cactus-like plant widely grown in India where it is eaten as a vegetable and used as an ingredient in curries and chutneys. What we can confirm is that Caralluma Fimbriata, like the South African "succulent" plant Hoodia Gordonii, has indeed been chewed for many years by Indian tribesmen during long hunts to suppress appetite and enhance endurance. But from there, the breathless weight-loss claims for Apatrim not only become more suspect, but seem likely to ultimately involve its distributor, PatentHEALTH, LLC , with the judicial system. And the battle of the diet scammers goes on. Referred to on one online site as "Indian Cactus," it may have appetite suppression properties, but demand for such can lead to so many negative effects. I guess one good side effect is that it might take away some of the demand for Hoodia. I also noticed while browsing that on at least one "New Breakthrough in Dieting" website, a very nice photo by Gerald Barad on the Cactus-Mall, is used - probably without permission - and another photo identified as C. fimbriata is actualy Hoodia gordonii. O well, who really cares hey? Hardy agaves and yuccas add spikiness and structure. There are even cactus that live through our winters if you provide good drainage, including the cartoon-shaped prickly pear (Opuntia cycloides). I always like to see garden sections pointing out some of the succulent options for our area, but why be so limiting. There's so much more that's possible than yuccas and agaves and "prickly pear." And what's O. cycloides? I guess it's a variety of O. engelmannii. Though that name doesn't appear in Anderson's The Cactus Family, it does appear in a few limited on-line sites, but primarily as a variety. There are whole bunches of Opuntias which are hardy here. In our own neighborhood, I know of at least 8 different opuntias growing at people's homes (though I have no clue if any of them are O. cycloides). I am a lazy gardener, and cacti are really easy and really pretty cool, not to mention the fact that there are a lot of weird guys out there (meaning cactus, of course) with really great shapes and they are just an all-around fun sort of a plant. I am a really bad waterer and most of my plants must live in drought conditions, so cacti fit the bill. Besides, I really do love the textures and feel of them too. Lithops come in various sizes, markings and colors, like mottled pink, brown and gray. Flat-topped and stout, they look like cute fireplugs or, possibly, distant relatives of SpongeBob SquarePants. 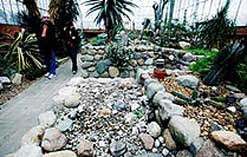 Lou Kilbert of West Bloomfield, president of the Michigan Cacti and Succulent Society, has raised many lithops in a greenhouse, but says the plants are difficult for the average home gardener to keep alive. That may be true enough for the "average home gardener", Lou, but most of my cactus and succulent friends are anything but average home gardeners. Another leg stretching excuse is to carefully prowl the slopes in search of the red blooms and sharp spines of hedgehog and prickly pear cactus. I meant it when I said carefully. Once I had been inclined to photograph the roadside flower bonanza when I experienced my first Oregon cactus; its piercing needles bayoneted my foot, right through my shoe! 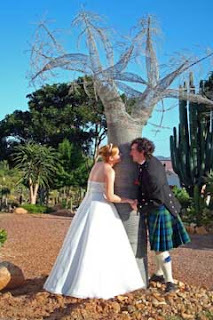 Apparently this couple from Scotland is crazy enough about cacti & succulents to travel to South Africa and get married in Soekeshof Gardens, the largest collection of Succulent plants in South Africa. 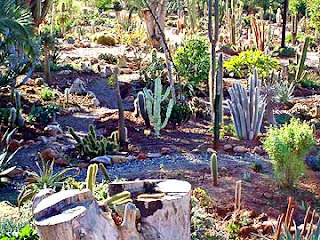 It contains the oldest cactus in S.A. (1910). (They appear to be standing next to a metal plant sculpture.) Find out more at Soekeshof Gardens. Every family has one and I happen to be yours. I have a small obsession with succulent plants. I research them, buy them, grow them, cultivate them and make them grow on anything and everything they will cling to. And so she has created a unique form of wedding decor for her upcoming wedding: a succulent wreath. It has a little growing to do, but, hey...Go for it "Crazy Plant Lady"! I Guess Some of us are "Avant-gardists"? 'Avant-gardists will tend to pick strong plants that grow especially large,' says Klaus Wagener, a world champion florist from Minden. Guenther Sator, a feng-shui expert based in Mattsee in Austria adds that avant-gardists love succulent plants because they grow in unusual shapes and are easy to care for. 'Thanks to their slow growth, you can retain their structural elements for a long time,' he adds. Smaller plants can be arranged in a glass bowl or ceramic block filled with sand, rocks and gnarled roots to create a miniature desert garden. Cacti are another good idea. 'You create attractive views, scenery and niches by potting them in large earth toned, sand-filled pots,' says John Langley, a professional florist from Hamburg. "Tired of blossoms in your flower garden that dazzle and sizzle but are quick to fade? Maybe it's time for some dependable succulents — the enduring plants that last through the good times but also, especially, the bad." There's a growing appreciation among gardeners of plants ''for their shape and their form and their geometry and the elegance that comes with that, as opposed to the 'I just want to grow annuals' or 'Give me my petunias or roses,' '' said Debra Lee Baldwin of Escondido, Calif., author of Designing With Succulents (Timber Press, 2007).